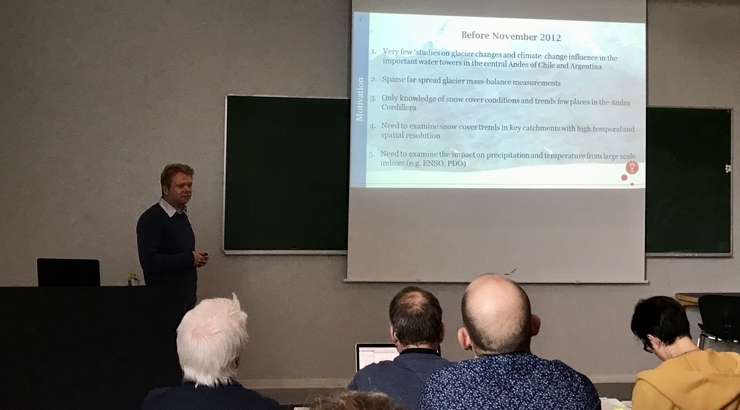 PhD-candidate Jeppe Kjeldahl Malmros at the University of Copenhagen defends his PhD-dissertation: "Snow and ice changes in the Andes – Assessing trends and drivers from 1950's to present day". He has been supervised by tha Nansen Center director Sebastian H. Mernild. With Mernilds expertise the Nansen Center has expanded into new areas of climate and environmental reseaerch like in this case on the glaciers in the Andes. - Recruitment of new reseachers through supervsion of PhD-candidates is very important and relevant for the Nansen Center, says Mernild. 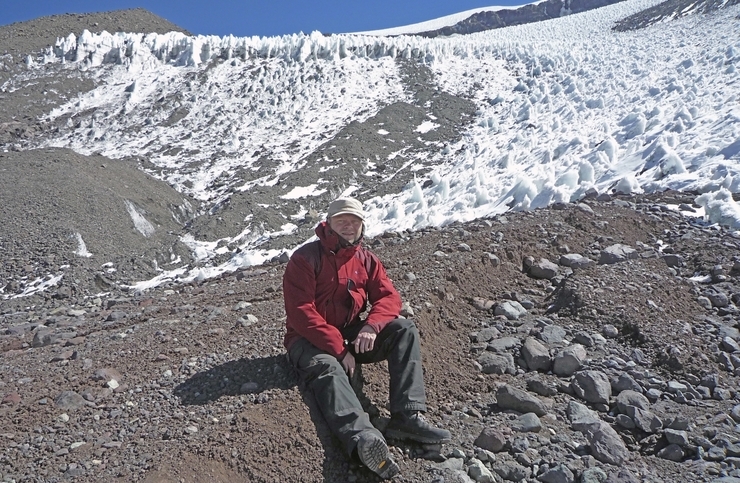 Jeppe Kjeldahl Malmros´ dissertation aims to improve our understanding of the cryosphere, its evolution and drivers specific to the Andes Cordillera of South America, especially related to snow cover, glacier area, and glacier mass-balance. The cryosphere of the Andes Cordillera is undergoing changes at a rapid and accelerating pace. Reductions in snow and ice cover impact surface energy and hydrological balances in affected areas. Also affected are populations who rely on the steady flow of river freshwater for irrigation, drinking, and in hydropower production that originate from snow and ice melt. Retreat and melting of glaciers often leads to a redistribution of seasonal runoff regimes leaving a reduced river runoff in late summer. Subsequently, the added meltwater contributes to sea-level rise with global impact. This thesis improves our knowledge about ice and snow conditions in the Andes from 1955 to 2016. It examines the impact from drivers of change, e.g., temperature, precipitation and large-scale atmospheric oscillations and utilizes a wide range of time-series including remote sensing imagery, climate station data, glacier mass-balance observations, as well as measured and modelled climate forcing, and simulated data to explore and improve our current knowledge of climate change impacts in the cryosphere of the Andes Cordillera. This thesis shows that glaciers in the Andes Cordillera are negatively out of balance with current climate. Especially glaciers in the north and central parts of the Andes show negative mass-balances. In addition, glacier area changes in the central Andes of Chile and Argentina show recession on average 30% since the 1950’s, recession rates that are accelerating. The state and evolution of glaciers in the Andes links with ongoing climate warming and changing precipitation patterns influenced by large-scale climate oscillations. If these climate conditions are to persist over longer periods it will have severe effects on available freshwater resources. The dissertation takes place at the Department of Geosciences and Natural Resource Management at Copenhagen University 18th of January.